I hated every minute of training, but I said, 'Don't quit. Suffer now and live the rest of your life as a champion'. I'm a fighter. I believe in the eye-for-an-eye business. I'm no cheek turner. I got no respect for a man who won't hit back. You kill my dog, you better hide your cat. You lose nothing when fighting for a cause ... In my mind the losers are those who don't have a cause they care about. Often it isn't the mountains ahead that wear you out, it's the little pebble in your shoe. If they can make penicillin out of moldy bread, then they can sure make something out of you. 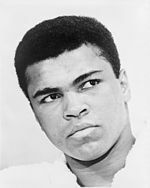 January 17 1942) is an American former professional boxer philanthropist and social activist. Ali changed his name after joining the Nation of Islam in 1964 subsequently converting to Sunni Islam in 1975. They have one son Asaad Amin whom they adopted when Amin was five. military based on his religious beliefs and opposition to the Vietnam War. Nicknamed "The Greatest" Ali was involved in several historic boxing matches.